I design and handcraft the jewelry offered on this website. For my bead jewelry, I use vintage and collectible glass beads, mineral beads and pearls. Lately I have become entranced by Czech pressed glass beads. These beads are made in small factories, in small runs, using bead molds and color mixes handed down from generation to generation. Translucent Czech opal glass seems to be lit from within, and the mottled 'picasso finish' lends a vintage richness to many colors. Czech flower beads hearken back to the garlands of a pastoral culture in tune with nature, human love, and enjoyment of life. At shows when availability permits, Bowerbirds offers handmade jewelry by two excellent local designers with their own takes on beadwork. Mary Lowe of Starlight Glassworks offers brilliant floral fantasy jewelry including her own lampwork flower beads and bronze clasps. Holly Patterson's jewelry is beautiful, structurally interesting, and can frequently be worn in two different ways -- please see her page for a few examples of her work. If you live in the Houston/Gulf Coast of Texas area, I encourage you to attend Bowerbirds' shows (see show schedule) to shop for the biggest selection of original designs. On this site you will find some of our offerings. At the Intergem shows and some of the other shows on Bowerbirds' schedule, hobbyists may buy some of the same glass bead mixes we use, kits for some of Kathryn's jewelry, Czech pressed glass and other collectible beads. Come see our fine selection of colorful art wire and bead mixes to use in your own beaded wirework jewelry or miniature wire sculpture. Many of our Czech glass beads are available at our Etsy shop. If you are interested in a particular jewelry design or other item that you don't see at our Etsy shop, e-mail me and I will produce and send you the most relevant current images to you to choose from. Write me at Bowerbirds1@aol.com. Here's a picture of a blue male Satin Bowerbird. 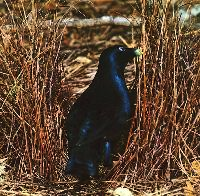 His life is dedicated to making the most beautiful bower (thatched structure) that he can to attract the equally discerning female Bowerbird. He decorates his bower with beautiful objects, including his own bright feathers. Bowerbirds live in Australia and the rainforests of New Guinea. Bowerbirds breed for artistic skill and are dedicated to beauty. Bowerbirds Jewelry was started and is maintained in the spirit of these wonderful birds.